The set is paladin only, The head, chest, legs and gloves are all Wrathful PvP set pieces, the final PvP set from WotLK. you can get them in Dalaran. The Boots match the set and are available with honor from the same vendor. The Shoulders are the Shoulders of the Corrupted Conqueror tier token from Dragon Soul, it drops from Hagara the Stormbinder on normal. The belt Dragonfracture Belt drops from Ultraxion and is the Pally tier set matching belt. 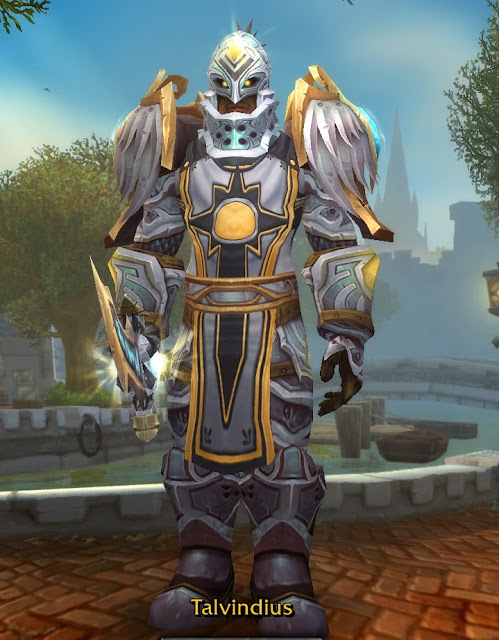 The tabard is Argent Crusader's Tabard which requires you to "beat" the Argent tourney, doing all the quests up until you earn the title Crusader. It costs 50 Champion's Seals. The sword is Quel'Delar Might of the Faithful, one of 4 versions of the Broken Blade quest reward, this one being the 2h Strength version. You can get the broken blade from any mob in Heroic Lich King Dungeons ( Forge of Souls, Pit of Saron and Halls of Reflection.) It's BoE so you can find it on the AH for between 7 and 11k.